The Payammal Sathrughna temple, 6 km from Vellankallur along the Irinjalakuda-Kodungallur route, is one of the few Sathrughna shrines in the State. The Payammal temple is about seven kilometers from Iringalakuda Koodalmanikya temple in the Iringalakuda Mathilakam route. Sathrughna is considered to be the reincarnation of the Sudarsana Chakra(disc) in the hands of Mahavishnu. This is the smallest temple among Nalambalams. Of the four idols retrieved from the sea by the fishermen this idol is the smallest. All the other three temples have circular sreekovils but here sreekovil is in rectangular shape. Annual festival is conducted in the month of February / March, July / August, Karkidakam month is very auspicious month for the visit. 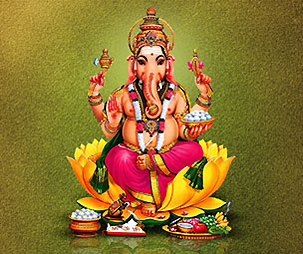 Ganesha also known as Ganapati and Vinayaka, is one of the best-known and most worshipped deities in the Hindu pantheon. His image is found throughout India, Sri Lanka and Nepal. The Payammal Sathrughna temple Thiruvulsavam 2018 february 27th to March 4th (1193 kumbham 15th to 20th. Thriprayar Temple houses a 6 ft tall idol of the Lord, holding Shankha', Sudarsanachakra, Stick and Garland, in a very ferocious form facing east. He is seen in standing posture. 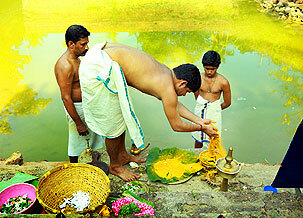 Vedi Vazhipadu and Meenoottu are the main offerings. The temple is under the control of Cochin Devaswom Board, an autonomous body. This temple observes SETHUBANDHANAM in every year in "Thiruvonam" day of Malayalam month "Kanni". The only place in earth wehere SETHUBANDHAN occurs in every year, in memory of those in RAMAYAN, is at Sree Raman Chira Chemmappilly. Chemmappilly is a nearby place to Thriprayar, 2 Kilometres apart from the temple. Whole arrangements are done by Thriprayar Devaswam.The temple is closed early after performing "Deeparadhana" and "Athazhapooja" (Evening and night poojas). At a time the early closin of Sreeramaswamy Temple is done only in two occasions in a year. One is for "Sreeraman chirakettu" (ie.Sethubandhanam)and another is "Arattupuzha Devmela"